If you're looking for an Easy Palak Paneer recipe that is crazy delicious, this is it. It's bursting with flavor and bright green color and dotted with tasty pan-seared paneer. It's a healthy, weeknight dinner recipe that's naturally vegetarian + gluten-free + paleo and can easily be made vegan by using tofu instead of paneer. Curry season has officially arrived! Ok, who am I kidding? It's always curry season around here. This palak paneer recipe has been on my ‘want to share list' for a while. Last winter, I wrote palak paneer on the list then bumped it to spring and again to summer. In August, I scratched it off altogether. Here's the deal … the thought of having to take pictures of a pile of (tasty) green mush was WAY too intimidating. Seriously guys, palak paneer is not exactly the prettiest looking dish. A few weeks ago, I received a comment from a reader. (Hi, Vlasta!) She said she loved my Easy Butter Chicken and asked if I had an Easy Palak Paneer recipe. I took it as a sign that it was time to pick up my camera and face my fears. This is one of my favorite Indian curry recipes. The gravy is rich and creamy and the bits of pan-seared paneer take it over the top. It's also ridiculously easy to make. Win win! This easy palak paneer recipe is based loosely off of my easy butter chicken recipe. The list of ingredients might look a little long, but putting the curry together is super simple. Every curry starts out with that fragrant combo of onions, garlic, and ginger. Tomatoes and spices are then added to the pan and cooked until a soft and chunky gravy starts to form. Your kitchen will smell incredible at this point. Since we're making easy palak paneer, we add a ton of fresh spinach to the pan. That's the palak part. Let it wilt, then transfer the gravy to your blender to turn it into the creamiest sauce ever. I add some cashew cream as well (a few cashews and some water) but you could use regular cream. Your choice! Before you pour the curry back into the pan, you'll want to sear the paneer. Technically, this step isn't mandatory. 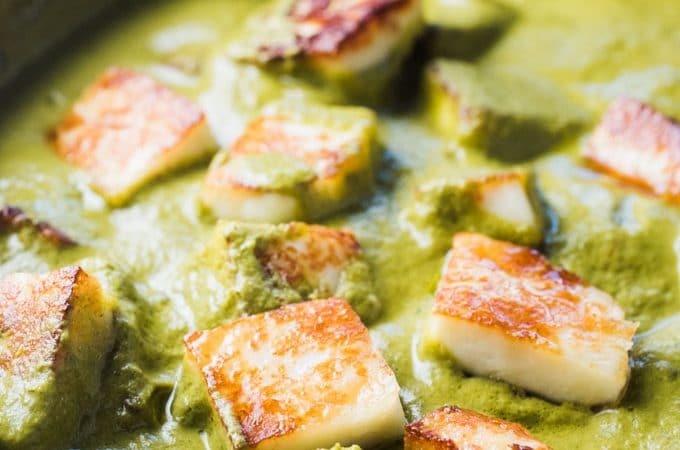 If you've only ever eaten palak paneer at a restaurant, you probably haven't had it seared. Here's the deal: paneer is SO MUCH BETTER after a quick sear in a hot pan. It transforms from something bland and almost tofu-like to something flavorful and rich and totally addicting. If you've ever had fried halloumi, you know what seared paneer will taste like. Take one taste of the fried paneer from the pan and you'll struggle not to eat every piece. Unlike most other cheese, paneer will soften in heat only slightly and instead develops a delicious cheesy ‘crust' when seared. It's magical. When the paneer has browned on two sides, pour the curry back into the pan and let it heat through. Dig in with some rice (or cauliflower rice) and dinner is served. If you're looking for an Easy Palak Paneer recipe that is crazy delicious, this is it. It's bursting with flavor and bright green color and dotted with tasty pan-seared paneer. It's a healthy, weeknight dinner recipe that's naturally vegetarian and gluten-free and can easily be made vegan by using tofu instead of paneer. Heat 2 tablespoons of the oil in a large skillet over medium-high heat. Add the onion and cook until it starts to brown, about 6-7 minutes. Add the ginger and garlic and cook for another 3 minutes. If the pan starts to look dry, add a little more oil. Add the tomatoes to the pan and cook for 5 minutes, mashing them a little as they cook. Add the garam masala, cumin, and turmeric to the pan and stir for about 1 minute. Add the spinach, working in 2 batches, if needed. Let the first batch wilt a little and then add more. Once the spinach has wilted, transfer to a blender, add the sea salt and cream or cashew cream and blend on high until smooth. Wipe the pan clean then add the remaining tablespoon of oil. Add the cubes of paneer and cook until brown on both sides, about 5 minutes. Pour the curry sauce from the blender back into the pan and warm through. Serve the palak paneer over rice or cauliflower rice. To make cashew cream, blend 1/3 cup of raw cashews with 1 cup of water in a high-powered blender. You will have more than you need for this recipe. So What’s the note for making the cashew cream. You said cashews and water but how much of each or do I just adjust things till I get a creamy texture? I’ve used medium tofu many times. It’s not an exact match, but it is really good. Another option would be halloumi. It wouldn’t be as soft but it would have a more similar flavor. I hope that helps! This was tasty, but a little too thick, and too salty. I’m wondering if I used the right amount/kind of cream? And I used coarse sea salt. I’ll definitely try again, but planning to add more cream and less salt next time. Thanks for sharing! Is that really ¼ cup of ginger? Just checking! I often let the paneer cooked enough, not until brown so I’m really wondering about the difference between our ways. I really like the flavor of browned paneer. It makes it taste a lot like fried halloumi! This was so good! I’ve made your lentil curry before and wanted to try something new. It did not dissapoint. Thank you! I’m happy you’re enjoying the recipes here! Hooray!! My daughter and I love this recipe. It tastes great and is so easy to make. It is now a staple when I am cooking Indian food. Love it! I’m so happy you like the recipe! It’s one of my daughter’s fav Indian recipes, too. Our girls have good taste! I’m so happy you liked it! Hooray!! What is paneer and where do you buy it? Paneer is a firm, Indian cheese. It’s similar in texture (but not taste) to extra firm tofu. It also comes in tofu-like packages. Where I shop, it’s usually sold with the rest of the cheeses. If you have trouble finding it, halloumi cheese or tofu would both make good substitutes. Thank you SO much! I cannot wait to try this recipe.